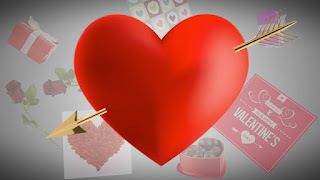 As you may already know, Valentine's Day was named after a saint - well, technically 3 different people named Valentine. You know about the one that married couples in secret and illegally because the Roman Emperor Claudius II made it illegal for young couples to marry (he wanted the men to go to war instead). The priest Valentine was beheaded on Feb 14, 269 B.C. and in 498 A.D. Pope Gelasius made him a saint and declared his death day the day of his feast - Feb 14. so Valentine's Day didn't start out as day of romantic love or friendship. Cupid got into the mix as he was the son of Venus, the goddess of love and he could make anyone fall in love by shooting his arrows to them, but he wasn't a baby and he wasn't that much fun, until he was changed into the cute baby we think of today - read more about Cupid here. Today, Valentine's Day has very little to do with a saint or Christianity. it has a lot to do with greeting cards, flowers, and candy. About 1 billion cards are exchanged on this day and about 50 million roses are given (more facts here) so of course you see a lot of ads and commercials for this day because it is a big money-maker for businesses. It's a fun way for kids to celebrate friendship. Teens and adults though become really involved in expecting great gifts and great acts of love during this day and it may cause more headaches than romance. - Why letters and greeting cards? Hubpages. - Five myths and legends. TSM Interactive. - Awkward and funny Valentine's day cards from kids: Ranker. A.D.: “Anno Domini” or “in the year of our Lord”, so after Christ’s birth.